Across sub-Saharan Africa agriculture is the backbone of the economy, accounting for 30-40% of nations’gross domestic product, and a leading source of jobs for over two-thirds of the population. Improving the productivity, profitability and sustainability of agriculture on the millions of farms that cover the African continent is essential for ending poverty and boosting shared prosperity in the region. Even though women make up a large share of Africa’s farmers, they are, for the most part, locked out of land ownership, access to credit and productive farm inputs, support from extension services and access to markets, to name just a few factors essential to their productivity. This array of daunting challenges means that, on average, Africa’s female farmers produce less per hectare compared with men, which adversely affects their families, communities and – in the long term – entire countries. Despite the centrality of agriculture in the economies of most African nations, relatively little is known about why farms managed by women are on average less productive. This“knowledge gap” in turn translates into a “policy gap” in the steps that African governments, their development partners, business leaders and civil society can take to equalise opportunities for female and male farmers. 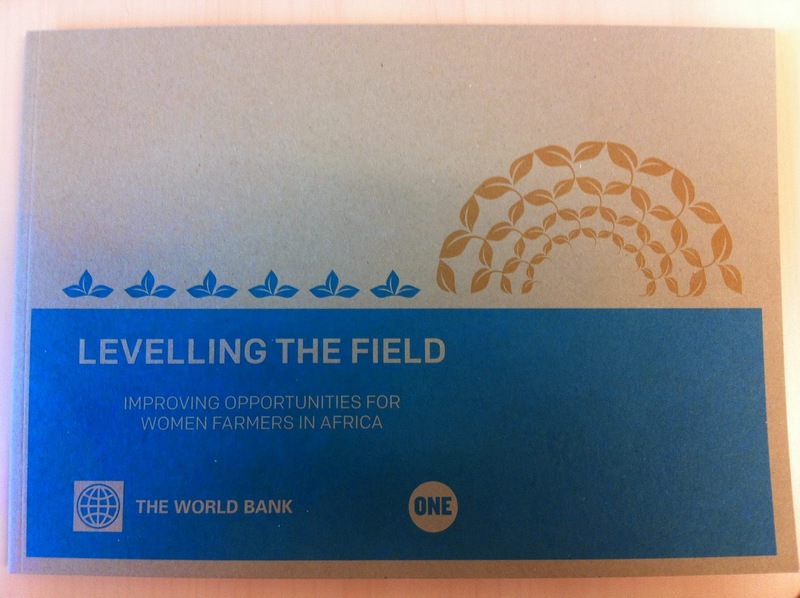 On 16 June IFAD invited the World Bank to present one of their most recent publications: “Levelling the Field: Improving Opportunities for Women Farmers in Africa”. This new report, jointly produced by the World Bank in partnership with the ONE Campaign with financial support from IFAD’s West and Central Africa Division, seeks to focus international attention on the impediments that Africa’s women farmers face in feeding their families, increasing farm incomes and lifting the heavy burden of poverty in rural areas. By combining information and backing it up with new surveys that allow for the disaggregation of results by gender, this report uncovers new evidence that explains some of the factors responsible for the low productivity of female-managed farms in Africa. The report profiles six countries – Ethiopia, Malawi, Niger, Nigeria, Tanzania and Uganda– that together account for more than 40% of sub-Saharan Africa’s population. It presents the clearest evidence to date about both the breadth and the depth of the gender gap in African agriculture. The presenters argued that existing agricultural policies need to become better attuned to the issues that undermine the productivity of female farmers, and new policies and programmes must be designed and implemented to address their particular needs. Ten policy priorities were presented that are informed by the main drivers of the gender gap identified in the country profiles. 1. Strengthen women’s land rights. 4. Provide community-based child-care centres. 5. Encourage women farmers to use more, and higher-quality, fertiliser. The presentation was followed by interventions from IFAD colleagues. Khadidja Doucoure, Regional Gender Coordinator in West and Central Africa, presented the significant progress that IFAD-supported projects in the region have made over the last years in promoting gender equality. IFAD’s Land Tenure Adviser, Jean Maurice Durand, explained that IFAD has learned that defending and expanding women’s rights requires comprehensive action at different levels: information and capacity building; organizational and empowerment measures; legal assistance and advocacy. Land tenure issues are inextricably linked to gender relations and thus a gender analysis is critical to design effective, targeted actions. It is often necessary to put complementary measures in place to enable women to influence decisions about their rights to land. Intra-household dimensions must be taken into consideration. Wafa El Khoury, IFAD’s Senior Agronomist, highlighted the importance of looking at the management of a farm in a holistic manner. The timeliness of labour and inputs is important. Given that traditional extension systems do not favour women, farmer field schools appear to be more appropriate. Women need to be encouraged to join farmers’organisations. Finally, IFAD’s Technical Adviser on Value Chains, Marco Camagni, emphasized that the starting point should always be the market. However, a balance must be sought between cash and food crops. Access to information is key and partnerships with the private sector should be strengthened.